Traditionally an adults-only indulgence, an imaginatively inspired afternoon tea is the perfect way to introduce children to fine dining. With its royal connections, London is the ideal city in which to find extraordinary and exciting teatime treats that will satisfy the most discerning adult palette as well as indulging the delightfully sweet fantasies of younger guests. An afternoon of indulgence doesn’t have to mean dealing with children’s sugar rushes on the way home. A low-carb, low-sugar variation of the traditional cakes and sandwiches manages to still feel like a treat, with healthy alternatives such as xylitol in place of sugar and smoked chicken with avocado taking the place of the usual buttered sandwiches. The chocolate cake, a staple favourite of children everywhere, is flourless and has a topping of yoghurt instead of sugary icing. The old-fashioned tea room is where Queen Victoria enjoyed her afternoon treats, so children and adults alike can truly feel like royalty! Price: £47.50 for a traditional tea; children under 11 are half price. With Frozen Fever sweeping the globe, this specially themed afternoon tea is a magical experience for young Disney lovers. Icy blue sweet treats include a ‘Royal Sceptre’- a perfect sphere of sponge decorated with praline and snowflake lace, and ‘Palace Snowflakes’ made with crushed sparkling meringue. Child-friendly sandwiches such as peanut butter and Nutella are available and for the adults, traditional scones and finger sandwiches accompany the more decadent fancies. The tea is held in Emmeline’s Lounge, named after the 19th century political activist, and the décor is subtly altered according to the theme; low blue lighting currently graces the lobby. The themed menu is rotated seasonally (look out for a Secret Garden selection featuring chocolate butterflies in Spring). With 150 years’ experience serving afternoon tea, Claridge’s puts its extensive knowledge and understanding of customers’ needs to full effect with the Children’s Afternoon Tea. Parties with children are tactfully seated in the Foyer area, so there is no need to worry that your child will be the only one chatting a few decibels too high; the atmosphere is one of a special rite of passage that families are comfortably able to share together. Adults can dine on a regularly replenished selection of sandwiches made with organic chicken and exclusively grown local cucumber; salmon with whipped aromatic butter; Burford brown egg on an exceptionally tasty onion bread and a perfectly balanced sweet and savoury creation involving Quicke’s cheddar with apple and walnut. If there is any room left for sweets, the offerings include two kinds of scone and four kinds of pastry, accompanied of course by an extensive selection of tea including the Claridge’s house blend. Younger VIP’s are invited to share in the adult selection as well as their own personal menu, which includes childhood favourites such as sprinkled cupcakes and ice-cream shaped sweets, while the menu itself doubles up as a colouring book. Bliss! This literary inspired tea is a delight to both adults and children. Celebrating the Sam Mendes-directed production of the timeless classic on the stage, the menu offers treats that readers will recognise as having jumped straight out of the pages. The chocolate golden egg filled with vanilla cheesecake and mango is particularly sublime, and younger guests will love the colourful homemade candyfloss. Particularly appreciated was the variance from the traditional finger sandwiches, which were on offer but were alongside a savoury tomato tart and leek and stilton quiche; this made a nice change from the usual filled breads. The signature ‘Charlie’ cocktail was also a surprising touch, laced according to the theme with chocolate bitters and finished with champagne. If you would prefer to stick to the traditional pot of tea, the menu is short but sweet: four specialist teas including a Chocolate Tea and Winter Spice. The quality and strength of the teas is more than enough to make up for the smaller selection, which can be overwhelming in other establishments. An utter extravaganza of colour and whim, this sensory adventure celebrates the 150th anniversary of Lewis Carroll’s classic novel. The delights of this experience are not just in the culinary creations but in the detail of the aesthetics. Menus are hidden within vintage book covers, miniature bottles contain ‘Drink me’ potions and sandwiches are displayed on ticking clocks as well as traditional china stands. The tableware has been considered in exceptional detail, with the book’s red-white-and-black colour scheme prevailing and it is difficult to decide which is better; the décor or the food. For adults, the smoked salmon, caviar and quail’s egg Scotch egg is an absolute dream, as is the Cornish crab and herb éclair. Adventurous palettes may enjoy the rabbit-inspired carrot meringue to balance the traditional scones, and The Sanderson has created five limited-edition teas to accompany the meal, including a memorable blend infused with blue cornflowers. Younger guests will love the pocket-watch macaroons, the marshmallow mushrooms and cookie soldiers, along with various other sweet treats. Price: £48 per adult; £35 for children aged 4-11. Whichever you decide, afternoon tea in London is a memorable experience. 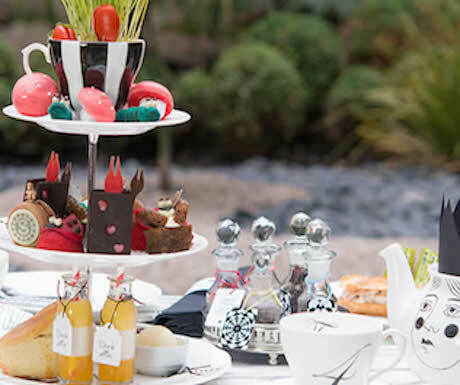 These child-friendly themed afternoon teas ensure that the whimsical delight and great British tradition of tea and cake can be shared happily with the next generation. I really enjoyed your post. I’m finding it hard not to book a vacation to London with just my grandson right now! He’d most likely enjoy it, but not like a granddaughter would. I think I’ll have to wait. Our whole family are great Disney lovers and the Frozen and Alice tea times appeal the most. Thank you for the information; I can’t wait to put it to use! Thanks Lori,’m so glad you enjoyed the post! How old is your grandson? There are some fantastic attractions in London for kids- the London Dungeons, Hamleys toy store and the Natural History and Science Museums are brilliant. And the Rainforest Cafe might be a good fit for dinner for a boy :) I do hope you get to visit one day!